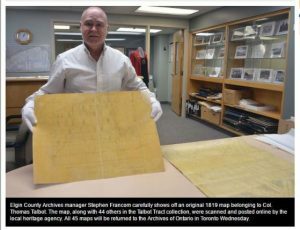 A nice article in the St. Thomas Times-Journal on the Elgin OGS contribution to digitizing and indexing the historic Talbot maps on loan to Elgin Archives from Archives Ontario. 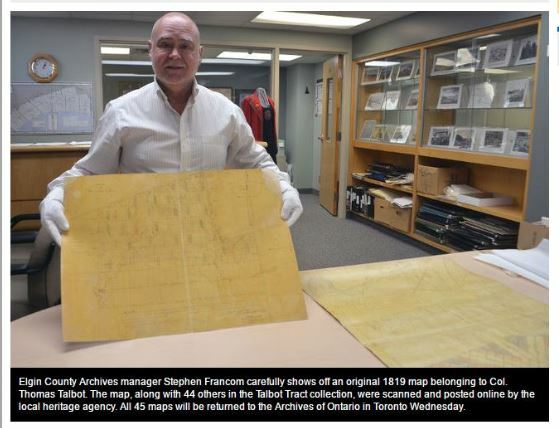 The digitization project was funded by the county along with a $5,000 donation from the Elgin county branch of the Ontario Genealogical Society. The Aylmer Express, 9 Dec 2015, also had an article on the map project. Posted on March 16, 2016 August 5, 2018 Author Bruce C. Johnson Jr.